I collect bookmarks. I used to be more active in my collection efforts and haven’t added a lot new bookmarks to my collection recently, with the exception of free The Bookdepository bookmarks. Which are pretty cool too. Still I have a pretty nice collection and as I love bookmarks I thought I would show you some of my bookmarks and tell you a bit about them. When I was little I collected more things, but usually lost interest in a while and nowadays bookmarks are one of the few things I still collect. Before I got my e-reader I only read physical copies and as I hate damaging my books I always used a bookmark. I like to match my bookmarks with my book in some way or sometimes I just pick a random bookmark, but I quickly found myself collecting different bookmarks. I ordered a lot of books from the bookdepository and tried to collect all the different bookmarks you get with your books. The first bookmarks I get from a type goes into my picture album which serves as bookmark collection map and the second bookmark of the same type is free to use. 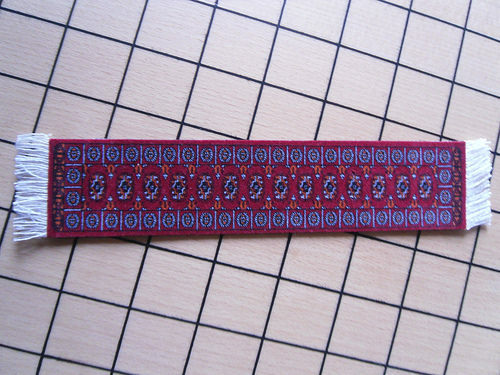 I am very careful with my bookmarks and try to keep them in great condition, just like my books. When I am traveling I take a not special bookmark and make sure the end don’t peak out from my book. I like how many varieties of bookmarks there are, there are the normal rectangular shaped bookmarks, but also bookmarks that don’t even look like bookmarks, but work just as well. 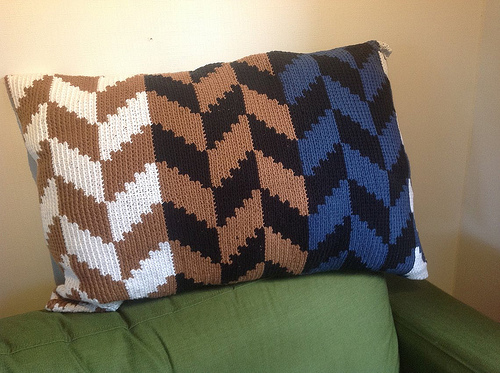 I also like how even the normal rectangular ones can look very different depending on what’s on them. I have quite a few bookmarks brought on vacation, like one from Scotland and one of the Berlin wall. It wasn’t really a conscious decision to start collecting bookmarks. I picked up bookmarks that looked cool and before I knew it I had a nice collection. Eventually I started looking for a place to store them in and I think it was my mom who came up with the idea to store them in a picture album. Only when I bought the picture album to keep my bookmark collection in, I started labeling it a collection. Bookmark Sprout. This is one of my favourite bookmarks. It looks like a tiny sprout, is green and it works great. I often use this one when reading physical books nowadays as it’s just so cute to see the sprout peeking out from the book. I love nature and I like how this one doesn’t look like a bookmarks, but works just as well. It’s an awesome bookmarks as it looks so original and it works just as good as a normal bookmark. Purple Book Thong. This is the only book thong I own. If I remember correctly I once won it thanks so a giveaway on a bloggers blog. It’s very pretty. It is a bit harder to use as it peeks out from both sides of your book and you have to be careful when putting the book down that it doesn’t lie on one of the ends. I do really like the colours and style of these bookmarks though and how it’s clear from all sides how far you are with the book. 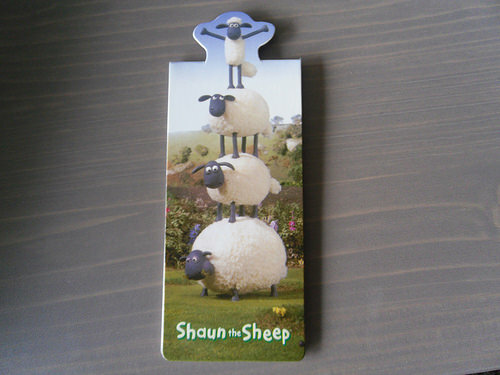 Shaun the Sheep bookmark. I think my boyfriend once bought this for me. I am a big Shaun the sheep fan so this bookmark makes me happy. It’s the type of bookmark that is magnetic and you can pull the two pieces apart and then put a page between it. Not my favorite style bookmark, but having a sheep pop out above your book makes up for that. Corner Bookmarks. 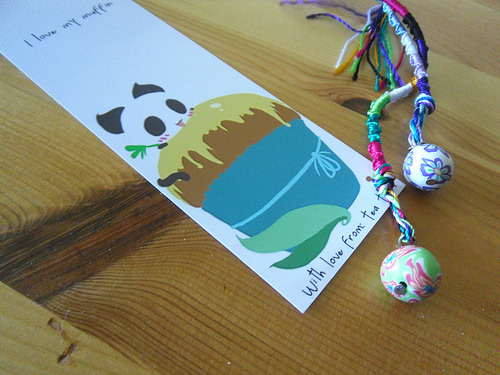 I once got these cute bookmarks from a fellow blogger. I’ll have to search for them as I am not sure where I put them when we moved to this house. They are quite handy, you basically shove them on the corner of a page and it looks like they are eating your book page. They are adorable and handy. Bookmark Carpet. While it’s a bit thick for a bookmark, I love the design and how it’s soft. The texture is great and it looks like a little carpet. I’ve seen these as mouse pads, but when I saw them as bookmark design, I just had to have one. Doggy Bookrest. This is technically a bookrest and not a bookmark, but it does have a bookmark attached to it. You can lean your book against the pyramid form and use the tail as a bookmark. I’ve used it a few times and while it is a bit big, it is comfy to have your book be able to lean against the bookrest. Usually I just use my own leg for that purpose, so the doggy bookrest doesn’t see much use, but I still love it. I recently used it twice with hardcopies and it works great for that as those books are quite heavy and the bookrest helps with handling them and makes for easier reading. This was a birthday present from my boyfriend once and it’s just just so cute! 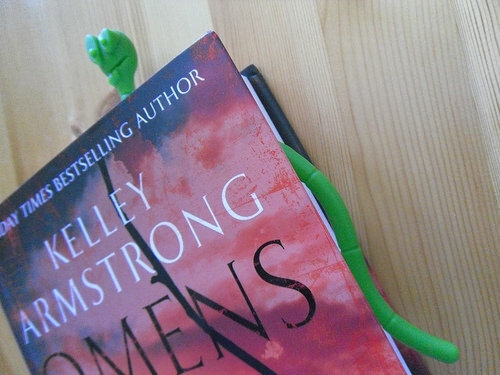 Kelley Armstrong signed bookmarks. I don’t think I ever used these bookmarks, but I am really happy with them. 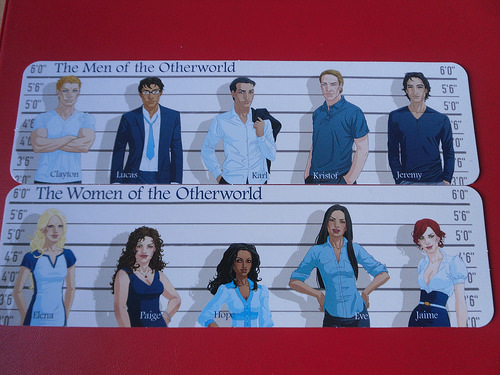 They are from one of my favorite series the Otherworld and show drawings of some of the characters. Most of them are exactly like I had in mind and it’s nice to have a visual of characters. And Kelley Armstrong is one of my favorite authors so I am happy to have something signed by her. 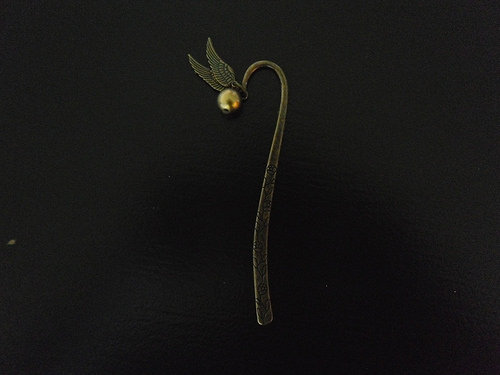 Harry Potter Golden Snitch bookmark. I mean how awesome is this bookmark. I don’t think I have ever used it, but it is so pretty! I bought here on etsy. Featuring the iconic golden snitch from the harry potter series, I just couldn’t resist buying this one and it was pretty affordable. That’s my dutch copy of the second Harry Potter book on the picture, one of my few battered looking books. Snake Corner bookmark. This snake bookmark was a Christmas present from my sister if I remember correctly. It only works well on hardcopies, as paperback copies aren’t heavy enough and it will slip out. So it’s really unhandy, but it’s just looks awesome. The snake is flat in the middle and it looks like it got squashed between the book pages. When I am reading a hardcopy I try and use this one. Photo album with bookmarks. I once bought a photo album in which I keep and display my bookmarks. 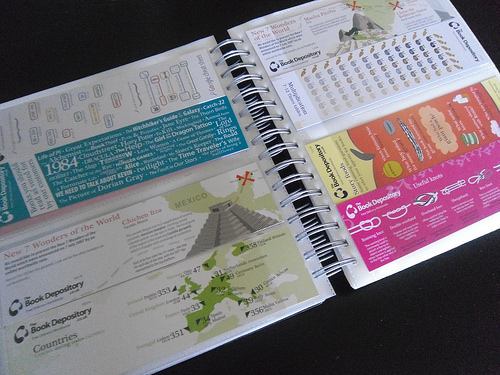 Below are two pictures of two of the pages of The Bookdepository bookmarks. I try and collect them and order them on year and then on the bookmark numbers. I don’t think I have managed to collect them all in a year as I always seem to get the same ones, but that’s okay. Most of my bookmarks fit into this book or lie on one of my shelves. 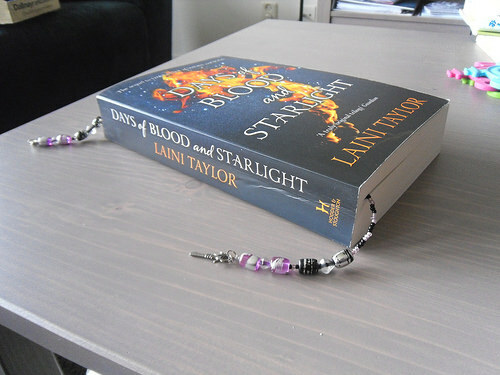 Swag and book related bookmarks. I also have a lot of swag bookmarks. 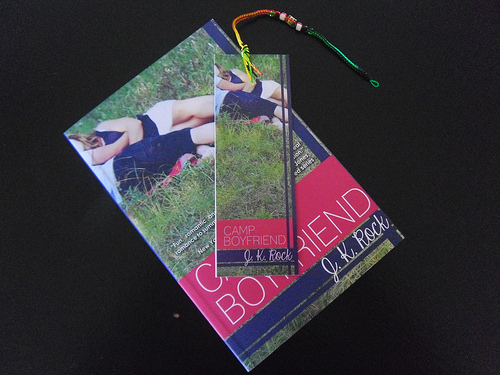 Some of books I have never heard about and others of books I enjoyed, like the Camp Boyfriend bookmarks below, which are some of my favourite bookish bookmarks, because of the colored friendship bracelet on the top. Berlin Wall bookmark. 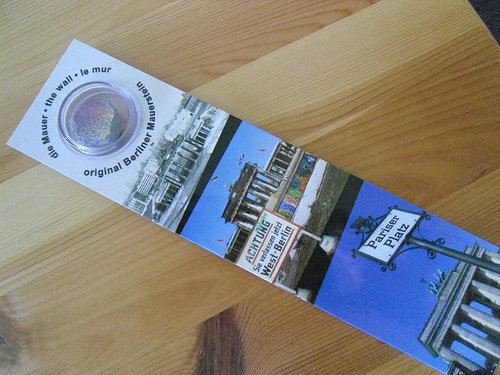 I bought this bookmark when I visited Berlin, it should contain a real piece of the Berlin Wall. 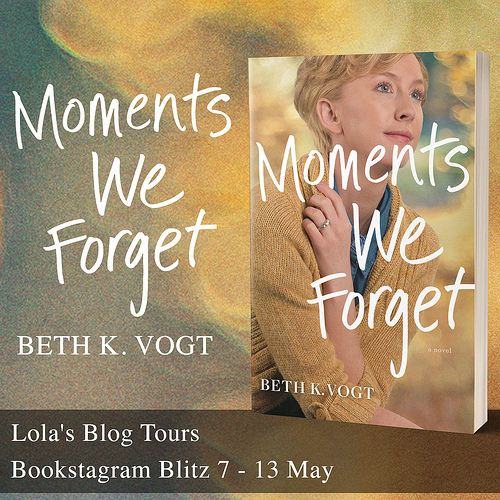 Not sure sure if that’s true, but I like the idea of having a piece of history in a bookmark. It was so cool to see a bookmark with a piece of stone, I just had to have this one. Others. Those are some of my most outstanding or weirder bookmarks, but beside those I still have a lot more of them, below are a few more pictures of some bookmarks. 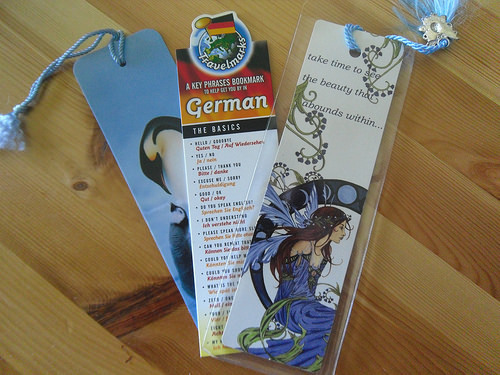 The first pictures features the following bookmarks: one with penguins (one of my favourite animals), one with german phrases from english to german, so fun to have a translation bookmark and one with a fea or fearie like creature which I thought was pretty. The second picture features a bookmark made by a dutch doujinshi circle (amateur manga producers) which my sister got for me on a anime convention and it has a cupcake and I love my sweets so it fits and the other two are two book thong like bookmarks, which are really pretty and have a ball on one end. What do you collect? Do you use bookmarks when reading? Do you like bookmarks? What kind of bookmarks do you have and what are your favourite type of bookmarks? What’s the most original bookmark you own? Aw, I love all these! I use to have a TON of book marks but the box was destroyed when our basement flooded. 🙁 I just started my collection again. ALSO, I started making beaded book thongs! Oh no, that’s so sad you lost all your bookmarks :(. You’re making beaded book thongs yourself? That’s so awesome! Show me a picture once, I would love to see them. Book thongs are so pretty! I really want to collect a few more of them as I only have one at the moment. Thanks! The picture album is very handy for storing them and keeping them clean and dust free, but some others just lie on a shelf. 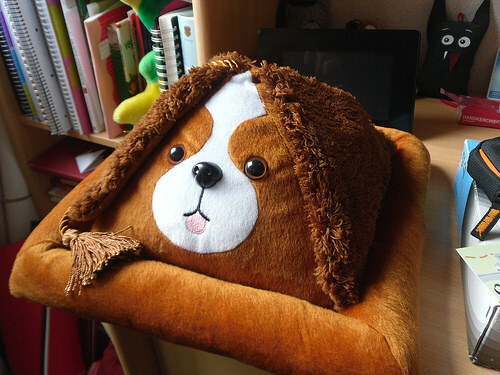 The doggie book rest is so adorable, I am so happy to have gotten that one. 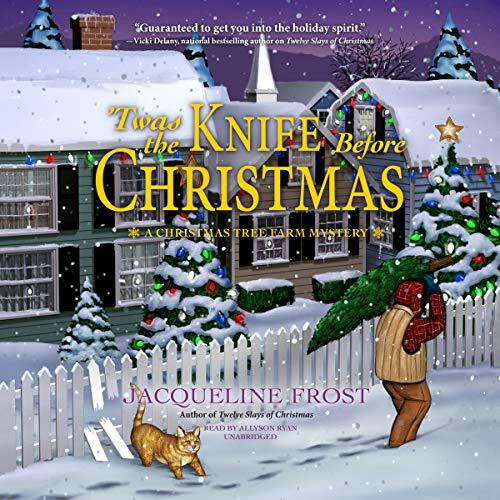 Tracy Krimmer recently posted…Three Little Things About Me …. Thanks! It’s fun to collect things. 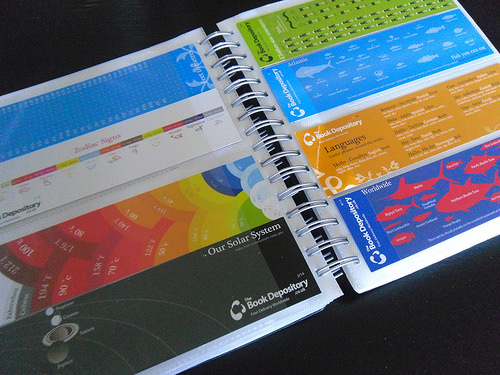 Do you also use the notebooks you collect or are they for collection purposes only? I don’t really collect them, but I love them 🙂 And I write in them! I also love notebooks, even though I don’t have a lot of them. I always have a notebook on my desk to write things down. The HP one is really cool indeed. It also was pretty cheap and I just couldn’t resist buying it when I first saw it. I never actually used it in a book though as it’s almost too pretty to use. That sounds fun making your own bookmarks. I think I have two bookmarks my sister once made for me in the album as well. And I once knitted a bookmark myself, lol. I think I still have that one. My bookmarks certainly see less use now when I read so many ebooks, but every time I pick up a physical copy that makes me even more happy to get to pick a bookmark for the book. Yay another bookmarks collector! I still love the flat paper ones and often think those still work best, beside my leaf bookmarks ofcourse. I don’t have as much bookmarks related to books. I do win some swag now and then and a few kind authors who send me some. I’ll make sure to check out your collection next! You have a nice collection of bookmarks. I have several, too. I didn’t consider myself a collector, but in truth, I have many. I store them in a coffee mug and I pull the one out for use that best matches the book I’m reading. My favorite is my orange tiger cat one that looks like my former cat. Love the picks of your collection! I never really considered myself a collector for a while, but then I realized how much I had fo them and was looking for ways to store them and decided the collector label did fit. I also pick bookmarks for the book I am reading based on which fits best or sometimes which bookmark I am in the mood for at that moment. That orange tiger cat bookmark sounds pretty! These are great, I have been trying to get more as a lot of my old ones have vanished so I am working my way through the magnetic Hobbit ones, I love them especially Gandalf ones! 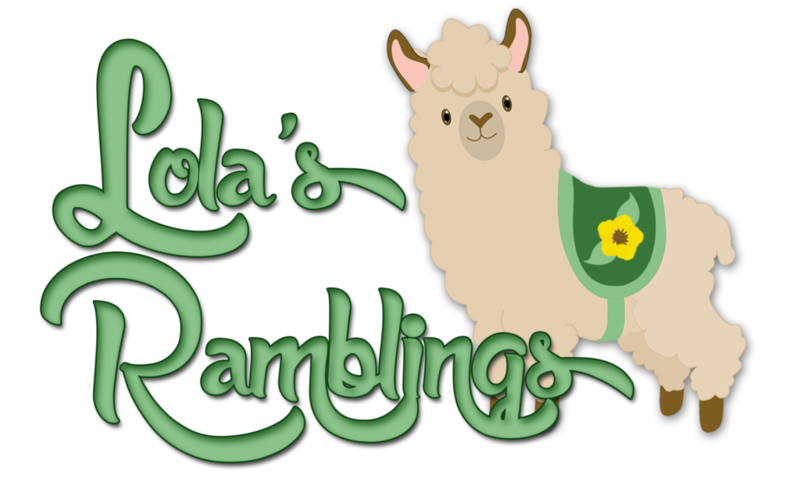 Heather @ Random Redheaded Ramblings recently posted…Beyond the Books – My Furry Baby! Thanks, I love my bookmark collection! That’s sad a lot of your bookmarks vanished. But yay for new bookmarks. I am not a big fan of the magnetic bookmarks as I find them hard to use, but they usually look really nice. I do a lot of my reading through the kindle, or my computer these days. I never was a bookmark collector, but I really love that Harry Potter bookmark you showed. Looks very antique. I really like the look of the Harry Potter bookmarks, it’s really well made and I like the materials, it looks a bit antigue indeed. I read a lot of ebooks nowadays as well, so my bookmarks don’t see that much use anymore. But every time I read a phsyical copy I enjoy picking a bookmark for it. I love the idea of bookmarks. But I hardly ever use ‘real’ bookmarks. I tend to use tiny scrap pieces of paper instead. Most bookmarks push my obsessive button on keeping the book looking nice. A lot of them I’ve noticed make noticeable (to me!) gaps in the book. Like, after using a bookmark, I notice that the book opens easily to the spots I’ve previously bookmarked as opposed to falling open to ‘random’ pages. And since that contributes to helping the book not last as long (since those pages would be a bit looser than others) I don’t end up using bookmarks. I used to use scraps of paper as well, I even have soe of thsoe stored in my bookmark album, but as I read mostly e-books nowadays I make sure to stop by my bookshelf and pick a bookmark when I am reading a physical book. There are a few bookmarks who make gaps indeed, but not all of them. There are quite some think bookmarks that don’t leave those gaps. While I want my books to keep looking nice, I never worried too much about bookmarks leaving gaps, maybe because I like bookmarks so much. There are also some of mine bookmarks who just lie aroudn looking pretty, but that’s part of collecting them. And using them as decoration for your bookshelves is a perfectly valid use for them in my opinion. The sprout and book worm are cute! I used to collect bookmarks too when I was younger, but I never used them. lol. I just saved them and used random papers or business cards to mark my place. 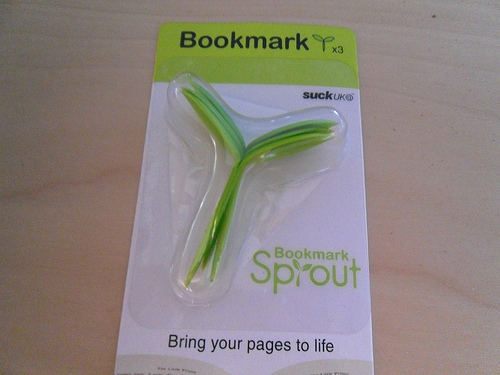 The sprout is one I use quite often, it’s so adorable and fun to use as bookmark. I have quite some bookmarks that I don’t use as often, but I still enjoy collecting them. 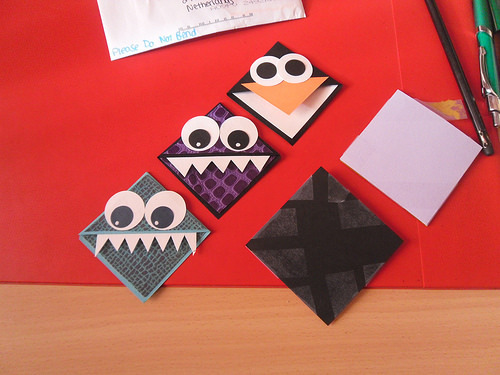 I love those page corner bookmarks, that’s so awesome you make your own! I have tried making my own once, but the teeth weren’t glued together well enough and kept falling out, oops. I like how many variaties there are when it comes to bookmarks. So many different types! I’m afraid I don’t collect anything, but I used to collect stamps as a kid – how original, lol ! My mom and grandma once started a coin collection for me when I was younger, I think I still have it lying around somewhere, but I never really cared much for it. I agree the sprout looks really natural and it’s just such a fun bookmark. 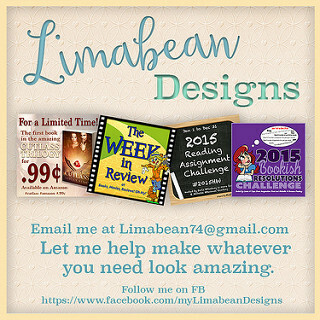 I would love to see your bookrest! I’ve never seen many bookrests around the blogosphere, but they can be quite handy when reading heavy books. Thanks! The sprout is probably my favourite as well. And the HP one is aweosme, even though I’ve never used it. I just love bookmarks as well…they are so fun and there are so many different styles to use!! I agree! The variety and different styles is what I like most and what makes collecting them fun! These are great! I have a little collection and have a book carpet too. I adore the sprout. I have to have one of those. 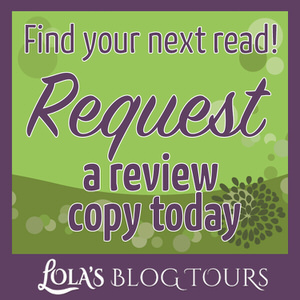 I like the texture of the book carpet ones, glad to hear you have one too! I hope you can buy one of the sprout bookmarks where you live. I actually bought mine at an american book store here in the Netherlands if I remember correctly. Okay my favourites are definitely the Snitch (because of course), the little sprout, and the corner bookmarks 😀 so cute! I have so many bookmarks. A lot of them come from The Book Depository, but I also have one signed book-related one, a few gifts, a bookmark calendar with 12 bookmarks related to Edinburgh, and a Benedict Cumberbatch photobomb cut-out! I tend to switch them up a bit. I’m also always reading multiple books so they come in handy! Those are some of my favourites too. 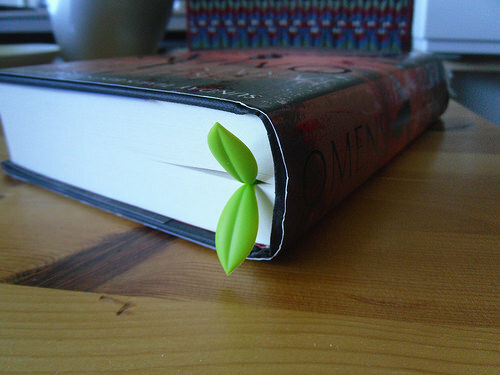 I use the sprout bookmark a lot as it’s practical and pretty! 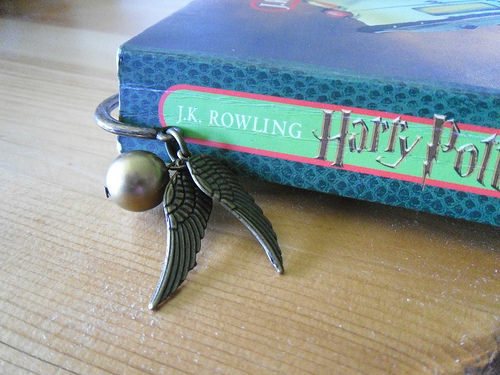 And that snitch bookmarks is just so awesome, even though I never used it so far I am happy I own it, the detail of the snitch with the wings is so well done. I have a lot The Book depository bookmarks as well, I like collecting them, although the collection of two years ago I think was my favourite. The were informational and had fun colours. I like the sound of your Edinburgh related bookmarks. I visited Edingburh, but have no bookmarks from there, although I do have one bookmark from scotland, from a castle we visited, it’s very thick leather and black. I absolutely LOVe your bookmark collection Lola! So many neat and innovative bookmarks, that sprout and snitch and carpet one is so cool as is the soft doggy one! I like collecting bookmarks, especially the slightly different ones like the sprout. The doggy bookrest actually saw some use when I was reading hardcopies last month. Thanks! Those are some of my favs as well. 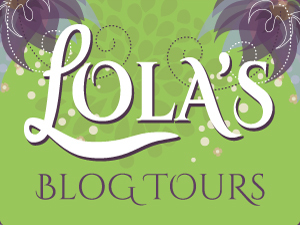 It’s so fun collecting bookmarks and seeing how many different ones there are. I like those The Bookdepository bookmarks and how they have a different series each year. I can’t stand the thought of dog earign my books, the horror! I am really carefull with my books, I can’t stand it when someone cracks the spine. My sister would like the crack her spines were I could hear it and I always visibly shivered. That sound is horrible. My Harry Potter books are one of the few that look tattered, as back then I wasn’t as carefull and they have been read by me multiple times and once by my mom as well. That’s actually a funny story as my mom bought the first HP book for herself, but I had nothing to read and started it before her and then we both loved the series, but I got to keep the books and could read them first, yay! This is inspiring me to want to collect bookmarks too! What a fun collection! 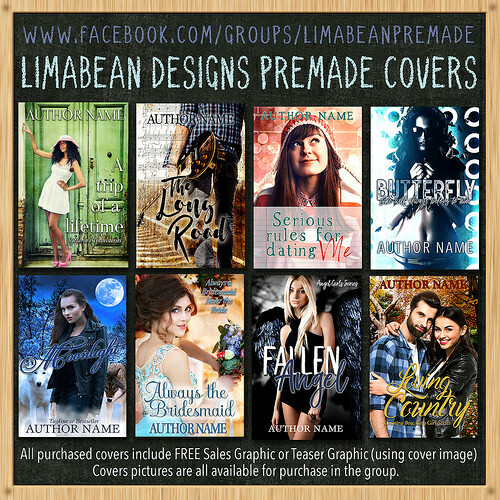 I have a lot of swag bookmarks, and I’ve been thinking about what to do with them – are those just regular photo albums you used? Thanks :). Yes it’s just a regular photo album, normal sized bookmarks fit surprisingly well in it. Although I usually fit two next to each other on one photo spot, as bookmarks are much thinner as pictures. I still have to add all my swag bookmarks to my album. What a nice collection! I like the sprout one. I don’t have many bookmarks because I usually use my Kindle and before that I just used a piece of paper. I have started collecting a few though. Maybe one day I’ll get enough together to do a post on them. Thanks! 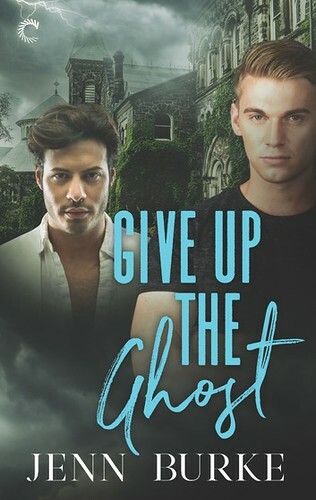 I mostly read e-books nowadays as well, so my bookmarks don’t see as much use as they used to, but I still love colllecting them. I hope you will do a post about your collection once you have enough of them :). I enjoy seeing other people their bookmarks. Hi I love your bookmark collection. I laminate my bookmarks to keep them clean and dust free. Never thought of a photo album. Thanks! I am glad you like my collection. That’s also a good idea to laminate them! The photo album works pretty well to keep them clean and dust free while not in use. Hey, awesome bookmark collection. I’ve always been privy to the book despository ones as some of the artwork on them are amazing. You mentioned getting repeats of the same one. Is there any possible way you’d be willing to sell them? Would def be interested in purchasing.